No wonder I have such high expectations! I figure if I can’t find someone to grow old with, who I’m this happy with, whom I love this much after 55 years together, well I’d just rather live with cats. 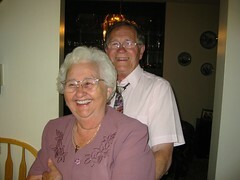 Happy Anniversary Oma & Opa! Live with cats? I THOUGHT YOU DIDN’T LIKE CATS! WTF!! LIAR!!! Previous Previous post: Smells Like…. Ew.